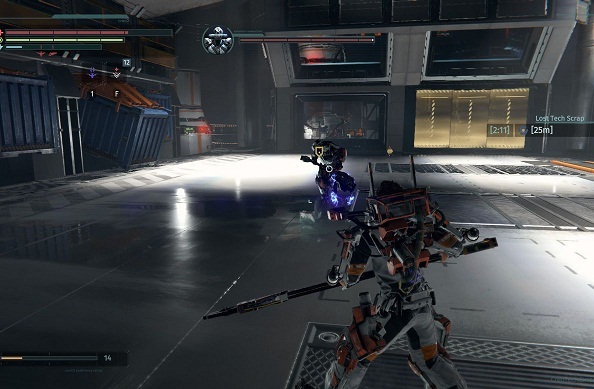 Black Cerberus is the fourth boss that you’ll encounter in The Surge. Here, you have to face several opponents and the fight takes a long time. If you defeat the Echelon 9 security boss, you will be rewarded with an achievement and you’ll also get the MG Judge v2.0. The beauty of the MG Judge v2.0 is that it scales very well with the weapon level and also has high attack power. It is slow in attack but not slower than most other two-handed weapons. So, it is worth to defeat Black Cerberus. When you first encounter the Black Cerberus, you see him surrounded by a group of opponents. Wait until he sends them away and then jump to him to challenge him to a duel. Observe your opponent a little to study the order of his attacks. They are not very diverse and once you have learned the pattern, you can venture into the offensive. What kind of tactics against the Black Cerberus works, we show you in our boss guide below. After defeating PAX in the first level, you will be well prepared for this boss. Doge his attacks and rely on counter attacks to reduce his health. It is really important that you study his attack patterns and then counter attack accordingly. Don’t move too far away from him, so that you can attack him at the end of his combo. After losing some health, he will call a PAX robot for help. The battle takes place in various phases, in which you should observe certain things. The boss can be defeated from phase two in different ways. - First Phase: The fight is still quite simple at the beginning. The attacks of the Black Cerberus are easy to guess and you should stay near him to beat him after the end of his combo. Use fast attacks and then jump back. It is recommended to take a quick one-handed weapon. - Second Phase: If the boss has lost health, he will escape through a side door and get a PAX-Mech. This is similar to the first boss P.A.X, but you cannot shoot rockets at him, as he attacks you with a single projectile. - Variant A: There are two large cylinders with which Black Cerberus can summon the PAX-Mechs. Imagine if the Mech is about to fire his bullet, and he will be gone at the last moment. He will shoot at the cylinders and destroy them. - PAX attack: If the cylinders are destroyed, you can attack the Mech and Cerberus will return. Fight him again with the same resources as in phase one. - Variant B: The PAX-Mechs spawn in certain time. Hurry up to fight and go offensive. Attack the legs and then hit quickly and hard. Black Cerberus will return and you can defeat him with some skill in the second round. When Cerberus returns, he has a dangerous surface attack, which you can avoid by positioning yourself behind or next to him. As soon as time is slowed and you hit the last hit, you should focus your attacks on his head, as you can get powerful patterns as a reward. After you defeat Security, you get the corresponding Achievement, 15,000 tech scrap, the MG Judge v2.0 and Black Cerberus armor set.